the nytpicker: The Bride Wore Pants! In Style Change, Today's NYT Dubs Man In Gay Wedding Announcement As "The Bride." The Bride Wore Pants! In Style Change, Today's NYT Dubs Man In Gay Wedding Announcement As "The Bride." In today's announcement of the Vermont marriage last night of Edward Farley and Matthew Horowitz, there's an odd and unexpected distinction given to Matthew. The NYT refers to him as "the bride." "[Mr. Horowitz] is the son of Sylvia Horowitz and Barry Horowitz of Wilton, Conn," the NYT wrote. "The bride's mother is an independent nutritionist, yoga teacher and personal trainer. His father works in Manhattan as a vice president and the general merchandise manager for Girl Scouts of the USA." And yet Farley is nowhere referred to as "the groom." The "bride" is an agent with Creative Artists Agency in New York. Maybe he negotiated the "bride" billing up front! A spot-check of several gay wedding announcements in recent months shows no references to either male partner as a "bride." Typically, the NYT avoids the gender-specific label by simply saying, "He is the son of..." and avoiding the problem altogether. Today's style change strikes us as a bold new step in some direction, though we're not sure what. Do gay rights activists want to see gender labels restored to wedding announcements for men? Or can the NYT just be enjoying its authority to subjectively assign one partner a "bride" label, just for fun? An earlier version of this announcement misidentified Sylvia Horowitz. She is the mother of Mr. Horowitz. Our hat's off to the unnamed author of this correction, who deftly managed to fix the mistake without even admitting to it. Nicely played, NYT! Does the NYT have any editors left anymore? It's starting to look like reporters can just click "send" and it goes right into the newspaper. Congratulations! But where can eggs be sold to make humanoid blob with the sweet and placid bride? This blog is largely influential, thanks for the gift of words. Isn’t time to monetize with ads? Hi, would love to offer to implant and incubate the potential persons in my state within a state for a thrifty sum. Please track me down elsewhere online. It was corrected and doesn't say Bride anymore! First. Can you somehow deal with the comments that just appear to be random 'bot inserts (e.g., the second and third anonymi)? Second. The Times' use of "bride" in this instance seems like either a deliberate -- and cheap -- swipe at gay people (we'll call the queenier one the bride) or a case of the Times growing and then losing its nerve. Third. The correction wasn't particularly deft. The mother was not misidentified. She is the mother. 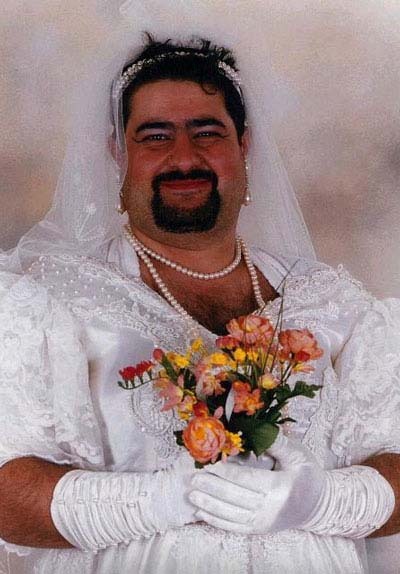 The person misidentified was the fellow labeled "bride."